The fifth annual Women in Business awards luncheon, presented by Conway Obstetrics and Gynecology and the University of Central Arkansas Foundation, took place Tuesday, December 6, 2016, at Centennial Valley Events Center. At the luncheon, four Outstanding Women in Business, two Outstanding Women in Nonprofit, and one Diamond Achievement Award recipient were recognized. In addition to honoring the seven award recipients, the luncheon also featured a guest speaker sponsored by Conway Corporation and Acxiom. Terilyn Juarez Monroe, chief people & culture officer and senior vice president of human resources at Acxiom, was interviewed by Melissa Dunbar-Gates of KARK/KLRT. As an executive committee member, Terilyn partners with senior leadership and the board of directors to drive business results through HR strategies and company-wide initiatives. In her role, she oversees areas that drive a high-performing culture, including talent acquisition and development, HR operations, and community relations/philanthropy, to name a few. 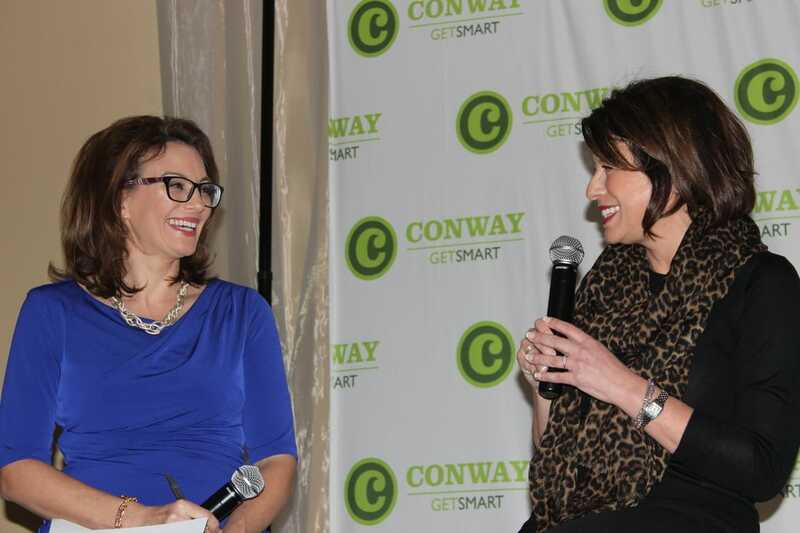 Melissa Dunbar-Gates (left) of KARK/KLRT interviews Terilyn Juarez Monroe at the fifth annual Women in Business awards luncheon. Terilyn Juarez Monroe is Acxiom’s Chief People & Culture Officer and Senior Vice President of Human Resources. More than 350 business leaders and a few high school women attended the luncheon. Thanks to Legacy Sponsor Textbook Brokers, young women from Faulkner County high schools along with a teacher and counselor were able to attend the event to celebrate women business leaders. They also received a $100 book voucher for next year and participated in a Women in Business roundtable in September. 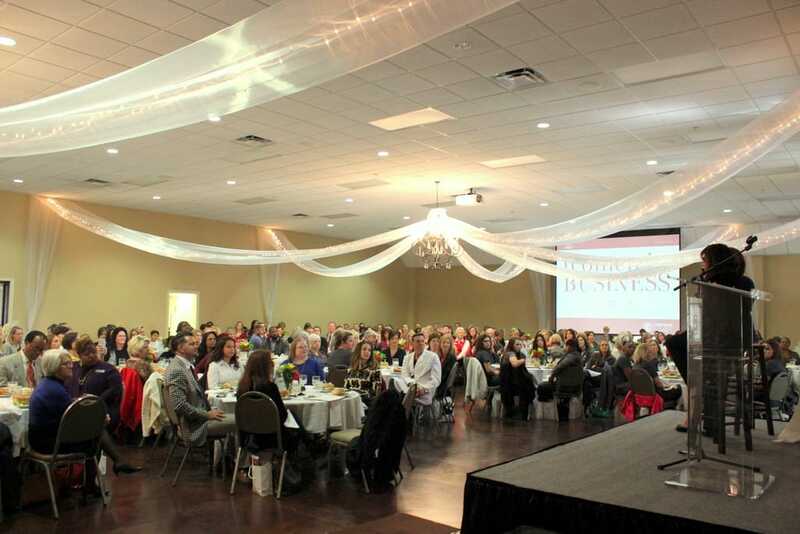 More than 350 people attended the 2016 Women in Business Awards Luncheon. 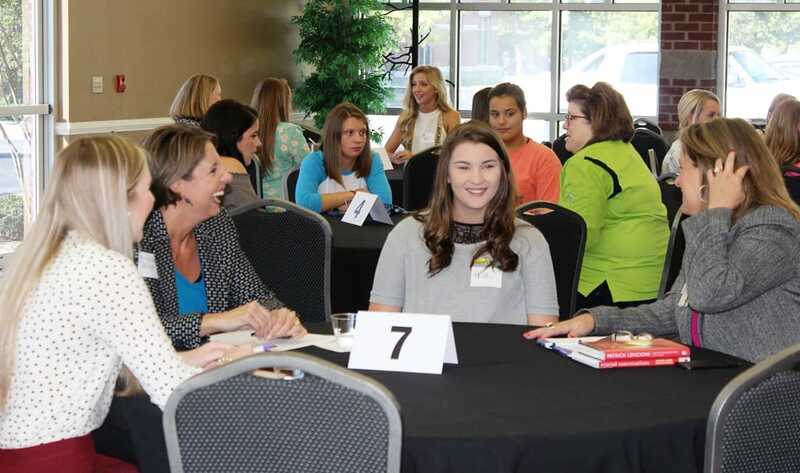 Girls from Faulkner County High Schools were selected to participate in a Women in Business Roundtable in September. The event was sponsored by Textbook Brokers. 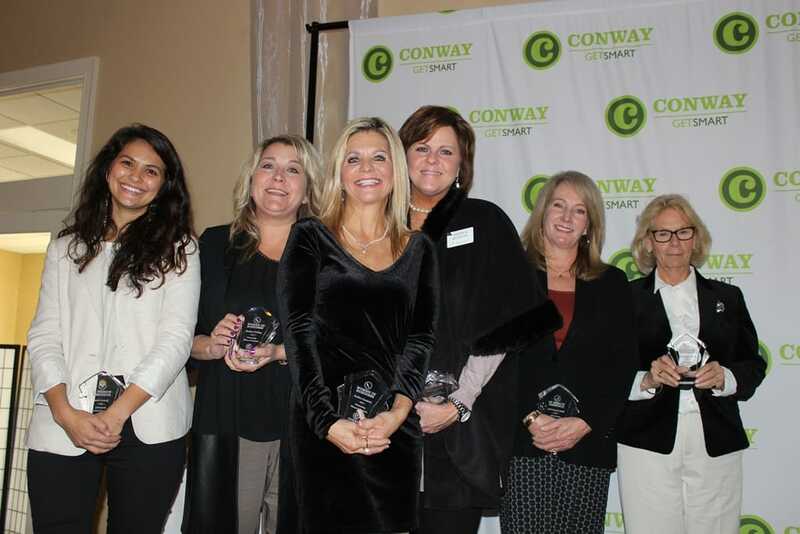 The awards, sponsored by RE/MAX Elite, honored these seven women in business and nonprofit. The winners were announced by media sponsor 501 LIFE in November. Almost 20 years ago, Rhea Lana’s Consignment began in a living room when a young mother saw a need for a better shopping and selling experience. That one idea has led to 80 franchises in 24 states. Rhea Lana has helped redesign the industry of children’s consignment events. She continues to pave the way, raising the standards of excellence and providing leadership across the country as the industry has grown. Rhea Lana and her business have been featured in The Wall Street Journal, USA Today, Bloomberg Business, numerous national TV and radio broadcasts, and in the International Franchise Association publication. She has received numerous awards, including the Top 200 Fastest Growing Franchises in 2016, Top Retailer, Top 50 Franchise Business, the Silver Stevie Business Award for Maverick of the Year, the Silver Stevie Award for Woman of the Year, and the Bronze Stevie Award for Company of the Year. Rhea Lana feels that it is important to communicate her vision and passion at a high level, and then equip, empower, and motivate employees and franchise owners to join in and accomplish something bigger than themselves. She believes that her biggest impact has been through the franchise of her business model, which has enabled her to mentor other women in business and encourage them as they find their way to business success. ​Jessica Crum founded Silverlake Design Studio over a year ago after working in the fashion industry. The company offered graphic and apparel design initially but quickly expanded to provide branding, web design, and all-around marketing services. In addition to many local companies, Silverlake Design’s client base spans from Los Angeles, California, to Miami, Florida. Jessica is passionate about empowering Silverlake Design’s clients and team members to aspire to their potential, discover their natural gifts, and use those gifts to give back. She uses this passion to help clients identify their niche and empower them to move toward their goals. Jessica is involved with several nonprofits in Conway, including Deliver Hope, City of Hope Outreach, Girl Scouts, Conway Ministry Center, Glenhaven Ministries, and Mosaic Conway Youth Ministry. ​Described as “a great leader with an exceptional work ethic,” “extremely genuine,” and “someone who builds trust at all levels,” Heather Drilling is a perfect fit for her role in human resources at Green Bay Packaging – Arkansas Kraft Division. Her work has involved successfully negotiating five labor agreements, acquiring commemorative items for the company’s 50th year, overseeing payroll and scheduling, and conducting employee-engagement surveys. As a woman in the male-dominated industry of papermaking, Heather strives to ensure that her female co-workers feel welcome and have a sense of belonging. She adheres to an open-door policy with all employees and communicates regularly with union leadership to keep relationships strong. Heather credits Green Bay Packaging for making her work-life balance possible. Her professional involvement includes serving on the Adult Education Advisory Committee and the Business Office Technology Advisory Committee at the University of Arkansas Community College at Morrilton. Personally, Heather invests time helping children less fortunate in the Morrilton and Conway area, serving as an advocate for the Children’s Advocacy Alliance. She also volunteers with the Sacred Heart Bazaar Committee and the Sacred Heart Endowment and Donor Appreciation Dinners. Debbie Goodwin and her husband started Arkansas Roofing Kompany out of their home seven years ago. They now own and operate three businesses in Conway. Debbie is no stranger to working in a male-dominated industry. In addition to her local businesses, Debbie has started a construction company and a horticultural company that supports low-income women. She has volunteered with Master Gardeners and wrote a horticulture column for newspaper and magazines. Currently, Debbie is working on plant cultivation and is developing programs to help South African women provide for their families. Outside of work, Debbie is active with the Arkansas Dream Center, Conway Symphony Orchestra, and New Life Church. She teaches ballroom dancing and exercise classes at the Faulkner County Senior Wellness & Activity Center and Brookdale Senior Living. As a Christian, mother, and wife, DeEnna Runyon takes Regions Bank’s five core values to heart: 1) put people first; 2) do what is right; 3) reach higher; 4) focus on your customer (and family); 5) and most of all, enjoy life. Armed with the realization that people bank with people, DeEnna believes that building relationships with customers and team members are the secret to success. She tries to lead by example and coaches her team to do their best. She conducts daily morning huddles with her team to set a positive tone and establish the goals for the day. She also celebrates successes with each associate, knowing that people who feel appreciated will work harder to reach their full potential. DeEnna is active in the Conway community. She counts being chairman of the board for the American Red Cross and president of Conway Regional’s Women’s Council among her top accomplishments. In addition, DeEnna is active in the Conway Noon Rotary and serves on the Conway Regional Health Foundation committee and the Dazzle Daze committee. Marla strives to lead by example and believes that if motives are pure, good decisions will rise to the top. The success of events such as Dazzle Daze provides a good example of teamwork and the importance of relationships she has been able to cultivate over the years. In addition to her work with the Conway Regional Health Foundation, Marla is active with St. Joseph Catholic Church and School. She is currently on the St. Joseph School Endowment Board of Trustees and chairs both the Church Parish Council and the Church Capital Campaign committee. Other community service includes work with Faulkner County Leadership, Junior Auxiliary, and Blackbird Academy of Arts. ​Donna Robertson has spent the last 30 years working in the mental health field. As a licensed psychological examiner, she has provided counseling services to thousands of individuals with the belief that she can help those living with mental illness become more independent, active members of their community. As co-director and clinical director of the Conway branch of Birch Tree Communities, Donna is responsible for ensuring the staff provides evidence-based best practices to help members. Her current mission is to educate decision makers about the daily struggle facing those living with mental illness in an effort to affect change in policy. Donna’s passion for teaching and counseling is apparent even when volunteering for her grandson’s baseball team. She teaches the boys how to work as a team, develop self-confidence, deal with defeat, and most importantly, how to grow into well-rounded individuals both on and off the field. Congratulations to the 2016 Women in Business honorees! 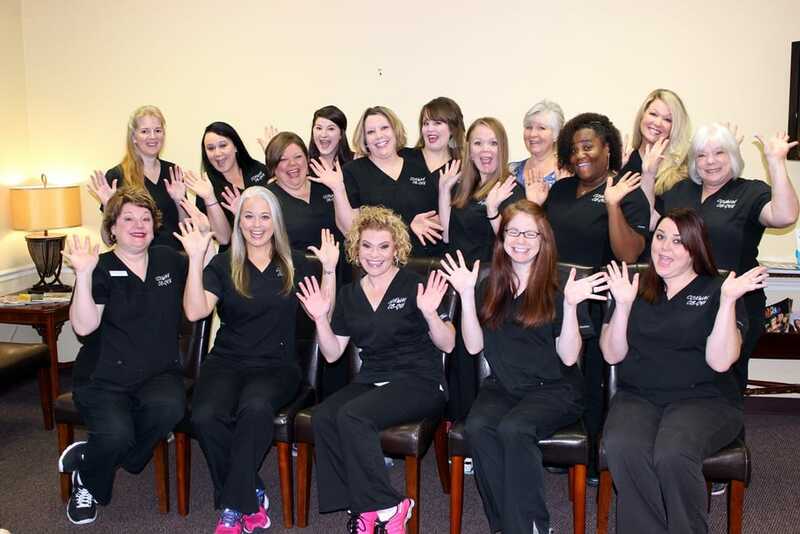 The staff at Conway Obstetrics & Gynecology, a presenting sponsor of the fifth annual Women in Business awards luncheon, congratulates the 2016 Outstanding Women in Business, Outstanding Women in Nonprofit, and Diamond Achievement Award recipient.